At a time when virtual communication is more widespread than ever, social media are an integral part of our everyday life, and many people no longer count the hours spent in front of a screen… to the detriment of their partner. Gleeden, the European leader of extramarital encounters with nearly 3.7 million members, interviewed more than 12,000 of their subscribers to find out if the time spent by their partners on social media was linked to their infidelity. For several years now, judgements are made based on a number of followers, the quality of a selfie, or the number of ‘likes’. It is the cult of the virtual appearance, the adoration of the photo filter, the pilgrimage of the hashtag. Infidelity: the rebellion of those forsaken by the social media? But while some play the game and work hard to build a beautiful virtual image, there is one thing that suffers: the couple. However, a study recently published by Computers in Human Behavior shows a 4.32% increase in divorces in regions where Facebook is most used, it seems that some people are frustrated by the time spent by their spouses on social media to the point of deciding to look elsewhere. Gleeden, the leading site of extramarital encounters, interviewed more than 12,000 members on this subject, and the figures are unequivocal: almost three quarters of them (72%) believe that their spouse spends too much time on social media, and 69% admit that they have already had arguments on this subject. 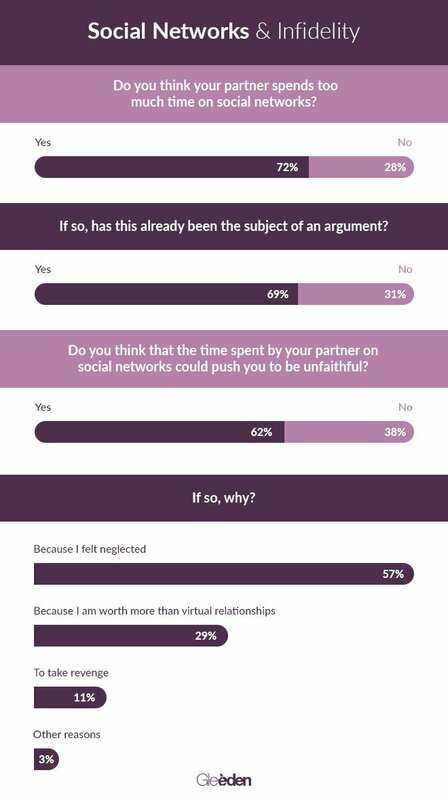 Still, 62% of the unfaithful admit to having crossed the limit to an extramarital relationship because their partner dedicated too much time to social media. And it seems that self-esteem takes a hit when the partner is stuck to his or her screen. While more than half (57%) of the members interviewed by Gleeden said that they felt neglected by their spouse, 29% of those had turned to infidelity to prove to themselves that it was better than having virtual relationships. It was revealed that 11% are particularly resentful and admit to having maintained an extramarital relationship simply to take revenge for the lack of attention from their partner. With this information in hand, some people may finally consider letting go of their smartphone.